District 4 • She becomes the first black Republican woman in Congress and the face of diversity for the national GOP. Steve Griffin | The Salt Lake Tribune Mia Love stands with her husband, Jason, as she is introduced as the winner of her congressional race in Utah's 4th district Salt Lake City, Wednesday, November 5, 2014. 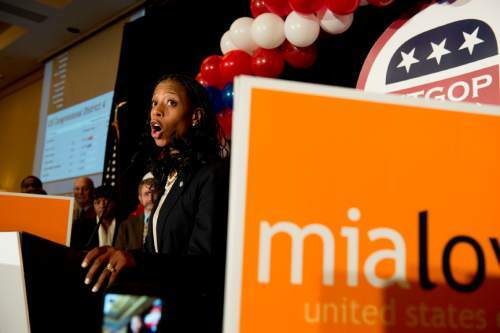 Steve Griffin | The Salt Lake Tribune Mia Love delivers her victory speech after defeating opponent Doug Owens in the race for Utah's 4th Congressional District, Tuesday November 4, 2014. Steve Griffin | The Salt Lake Tribune Mia Love screams with excitement as she takes the stage with her husband Jason after being introduced as the winner of her congressional race in Utah's 4th district Salt Lake City, Wednesday, November 5, 2014. Jeremy Harmon | The Salt Lake Tribune Mia Love gets a hug from her father after she beat opponent Doug Owens in the race for Utah's 4th Congressional District, Tuesday November 4, 2014. Jeremy Harmon | The Salt Lake Tribune Mia Love gets a hug from her father after she beat opponent Doug Owens in the race for Utah's 4th Congressional District, Tuesday November 4, 2014. 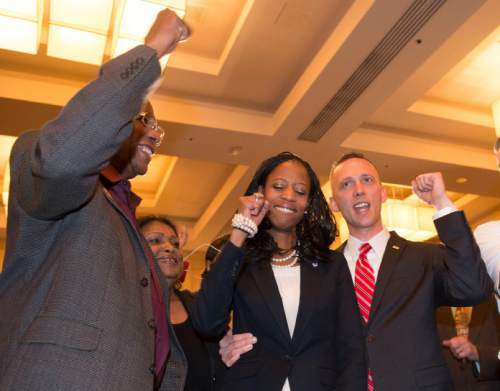 Steve Griffin | The Salt Lake Tribune Mia Love pumps her fist with her husband, Jason, right, and her father, Maxime Bourdeau, as she is introduced as the winner of her congressional race in Utah's 4th district Salt Lake City, Wednesday, November 5, 2014. 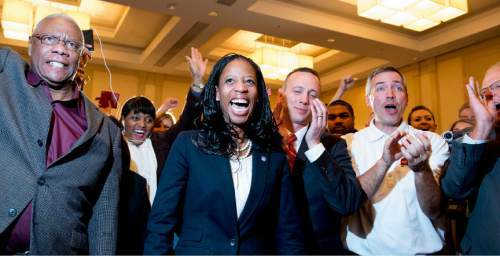 Jeremy Harmon | The Salt Lake Tribune Mia Love supporters celebrate as she takes a small lead over opponent Doug Owens in the race for Utah's 4th Congressional District, Tuesday November 4, 2014. Steve Griffin | The Salt Lake Tribune Representative Chris Stewart speaks to reporters during the GOP election night party at the Hilton in downtown Salt Lake City, Tuesday November 4, 2014. 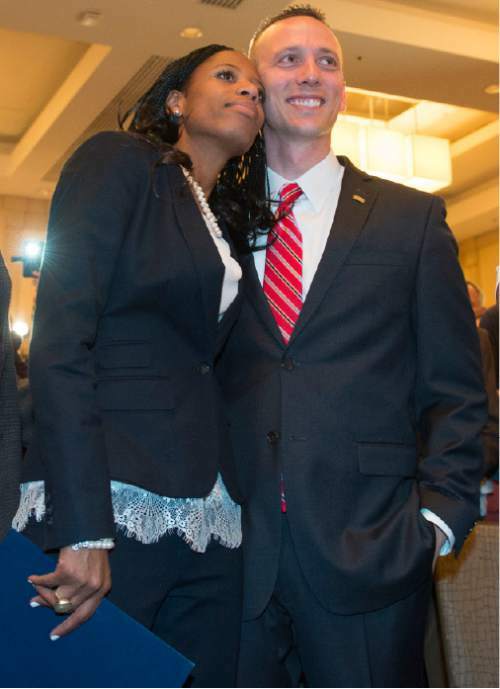 Steve Griffin | The Salt Lake Tribune Mia Love wipes tears from her eyes as she stands with her husband, Jason, right, as she is introduced as the winner of her congressional race in Utah's 4th district Salt Lake City, Wednesday, November 5, 2014. Steve Griffin | The Salt Lake Tribune With tears in her eyes Mia Love talks with reporters after winning the congressional race in Utah's 4th district Salt Lake City, Wednesday, November 5, 2014. 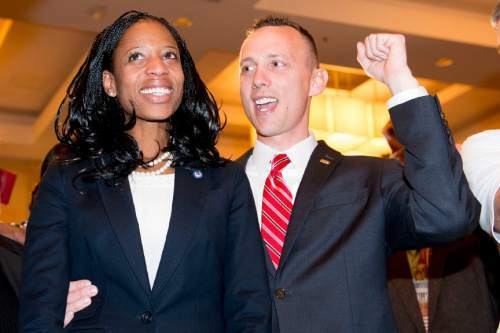 Steve Griffin | The Salt Lake Tribune Mia Love celebrates with her husband Jason after defeating opponent Doug Owens in the race for Utah's 4th Congressional District, Tuesday November 4, 2014. 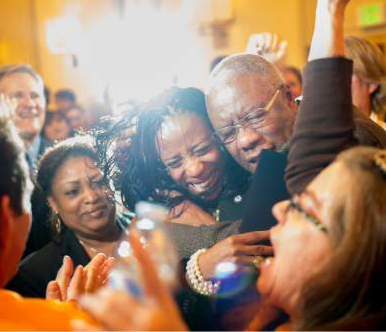 Steve Griffin | The Salt Lake Tribune Mia Love celebrates with family and supporters after defeating opponent Doug Owens in the race for Utah's 4th Congressional District, Tuesday November 4, 2014. 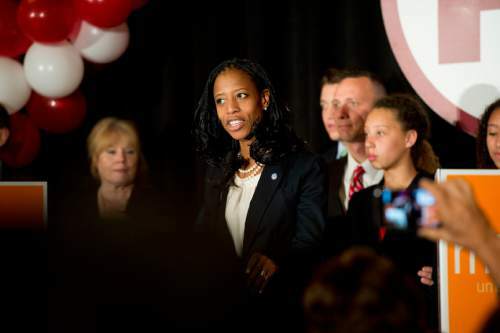 Steve Griffin | The Salt Lake Tribune Mia Love delivers her victory speech after defeating opponent Doug Owens in the race for Utah's 4th Congressional District, Tuesday November 4, 2014. 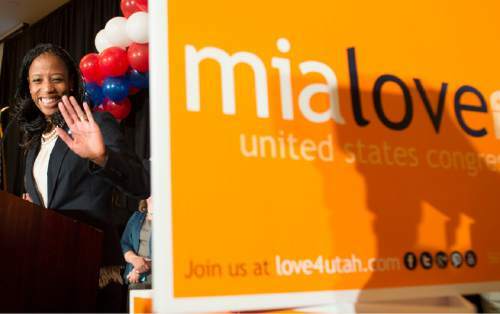 Steve Griffin | The Salt Lake Tribune Mia Love delivers her victory speech after defeating opponent Doug Owens in the race for Utah's 4th Congressional District, Tuesday November 4, 2014. 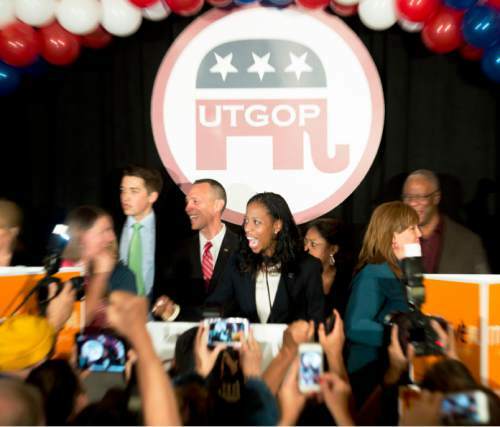 Republican Mia Love succeeded Tuesday where she fell short two years ago, besting Democrat Doug Owens in Utah&apos;s 4th District to become the first black Republican woman to win a congressional seat in 160 years of the Grand Old Party. After trailing Owens much of the night, she pulled ahead as late results rolled in from Utah and Salt Lake counties and claimed a narrow victory, 64,390 votes to 60,165 votes or 50 percent to 47 percent. "Many people said Utah would never elect a black, Republican, LDS woman to Congress. And guess what ... we were the first to do it," she told cheering supporters Tuesday night. LIVE CHAT: At 12:15 p.m. Wednesday, join political scientists as they discuss the election results and what they mean to Utah politics. 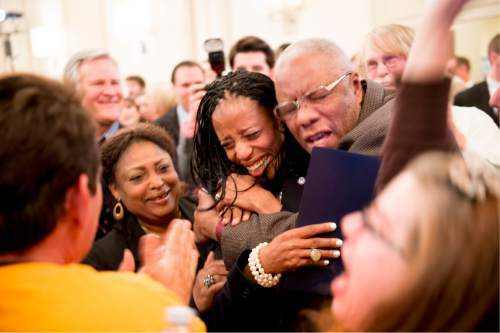 Love, the daughter of Haitian immigrants, was joined by her parents and family as she declared victory. "I am going to represent all of you in Washington," Love said. "This is a great night for our nation and, I have to tell you, it is especially a great night for Utah." Love was making her second bid for Congress after falling to Democratic Rep. Jim Matheson by a slim 768 votes two years ago  despite having the benefit of Mitt Romney at the top of the ticket in a heavily Republican district. Owens, the son of the late U.S. Rep. Wayne Owens, stepped into the fray, but was outmatched moneywise as Love tapped a nationwide network of supporters  built in large part on the strength of her heralded speech at the 2012 Republican National Convention  to spend $4.7 million on the race, roughly seven times as much as Owens. Damon Cann, a political science professor at Utah State University, said Love&apos;s win is big for the national GOP. "Since the election of Barack Obama, the Republicans have been more serious about trying to showcase the diversity within the Republican Party," he said, "and Mia Love is potentially the poster child for diversity in the party." Owens followed the Matheson playbook, appealing to moderate Republicans and independents, while bashing Love for statements she had made in 2012 indicating that she would do away with the Department of Education, eliminate federally subsidized student loans and slash billions from other federal programs. Love distanced herself from her 2012 positions  saying she was just trying to start a discussion on how to balance the federal budget  and accused Owens of attacking her personally, rather than debating the issues. Owens called that a dodge, saying Love was trying to divert attention from her "radical" positions on the issues. "It&apos;s [one] thing to change your position and another thing to deny having said what you said," Owens said during a debate between the two candidates. "Voters have not been getting straight answers when they&apos;ve asked [for] them." 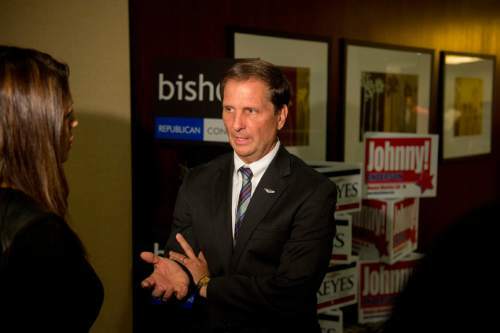 The Matheson model fell short for Owens, but a survey by Utah Colleges Exit Poll found that voters likely would have re-elected the Democratic congressman, preferring him to Love by a margin of 52 percent to 40 percent. Said Cann: "There has got to be [national Democrats] saying, &apos;I wish we&apos;d gotten into this race, because it shouldn&apos;t be this close.&apos; "
Owens conceded just before midnight. "I want to thank you all for joining in this fight. I&apos;m proud of what we fought for. I&apos;m proud of who we fought with," he said. "Let&apos;s lay us down and bleed a while and we will rise and fight again for all these wonderful things we believe in." During both of her campaigns, Love frequently told of how her parents fled a dictatorship in Haiti with $10 in their pockets, searching for a better life. She was born in Brooklyn, N.Y., and raised in Connecticut. A musical theater major, she moved to Utah after converting to The Church of Jesus Christ of Latter-day Saints. She served six years on the Saratoga Springs City Council before being elected mayor. Love was a favorite of national Republican leaders even before she officially jumped into the race in 2012. She is telegenic, articulate and reflects a diversity that is a rare commodity in GOP circles. There have been three black Republicans in U.S. House in the past 70 years  Gary Franks of Connecticut served from 1991-1997; J.C. Watts represented Oklahoma from 1995 to 2003; and Allen West of Florida held office from 2011 to 2013. Cann said Watts, in particular, rose quickly through the ranks of GOP leadership, in part because it showed the Republican Party could be inclusive. Love consistently has downplayed her race as an issue in her political life. When she declared her candidacy in 2012, she expressed disdain for the Congressional Black Caucus, saying she wanted to join the group "to take that thing apart from the inside." "It&apos;s demagoguery. They sit there and ignite emotions, they ignite racism where there isn&apos;t any," she said. "They use their positions to instill fear. &apos;Hope and change&apos; has turned into fear and blame." Recently, she softened those remarks and said she planned to join the caucus, but still hoped to change it so it doesn&apos;t pit people against one another. She acknowledged earlier this year that, if she wins, she likely would be a high-profile GOP spokeswoman and that the public role would mean she could do more for Utah than others in Congress might be able to deliver. "I don&apos;t believe you can change public policy without garnering public support and public opinion," she said. "I&apos;m no good to you if I&apos;m one vote of 435. … I&apos;m sure there are many reasons why they&apos;ll want to push me out there." Owens&apos; dad was a Democratic congressman from Utah from 1973 to 1975 and again from 1987 to 1993. He died in 2002 while on a peace mission in Israel. Doug Owens cited his father&apos;s ability to work with Republican members of the delegation as an inspiration and said, if elected, he would have tried to build bridges across the aisle to end the gridlock in Congress. Thomas Burr contributed to this story.